First, as of March 2013, the U.S. will switch to a "first to file" patent system, as opposed to the current "first to invent" system. There have been heated arguments from some activists that this will drive innovation away from the US, while proponents of the bill say it will ease the already lengthy and difficult process of patent prosecution. Second, the USPTO now has the authority to set and collect its own fees, instead of having them held in escrow by congress. This means the patent office will inevitably have more money to spend on things like hiring patent examiners, as well as providing funds to help the never-ending challenge to keep the PTO and its technology and methods evolving with the times. This change has mostly been debated by congress, who desired to keep control of the PTO's funds and appropriate what they deemed "extra money" into other programs or agencies. There has also been a change to stop a continuing and, frankly, deplorable trend among certain patent "trolls" by allowing what is called "virtual marking" on patented technology. Presently, every piece of technology subject to a patent must be physically marked to avoid lawsuits from third parties claiming they were damaged by "unknowingly" selling or manufacturing patented technology (it's as dubious as it sounds). Under the new law, marking may be done "virtually" where possible. But let's go back to number one. Why Is "First To File" A Big Deal? Article I, Section 8. U.S. Constitution. Opponents of the bill have argued that the use of the word "Inventors" in the Constitution limits the patent system to a filing basis of only first to invent, and that first to file is in direct contradiction to the Copyright Clause. You can expect a case made on this very argument to be making it to a federal court within months, or even weeks of the enactment of the change (March 2013). It's a very interesting constitutional question, and I can honestly see where they're coming from. But back to the big heading, who cares? The current system in America (first to invent), to put it into an example, works like this. If you invent something, let's say a widget crusher, and no one else has invented such a thing, you are deemed for legal purposes to have invented it from the day you begin working diligently on reducing that invention to practice (as in, making it work). So, let's say on January 1st, you come up with the idea for the widget crusher, and every day thereafter, you start working on prototypes and diagrams and generally do a lot of inventing. On June 1st, you produce a working model of the widget crusher. You file the patent for the widget crusher on June 2nd (writing a patent takes way longer than that, but for simplicity's sake...), only to find that Mega Corp filed a patent very similar to yours for a Widget Decimator on May 15th. You remember bragging about your idea to some friends, one of whom may have worked for Mega Corp, but you never actually published it anywhere in writing before filing. Mega Corp began work on the decimator in April, and because they have so many engineers, they completed it in a fraction of the time as you. Under first to invent, all you had to do was show that you began working (diligently) on making the same invention at an earlier date, and that you arrived at a solution without relying on the patent filed before yours. Once you show that, Mega Corp owes you mega bucks for their mega infringement. It doesn't matter if it was mere coincidence, either. Under first to file, the answer becomes much less clear. You'd have to prove that you actually disclosed the idea (is conversation with friends "disclosure?") first. If you didn't, then you'd have to try and prove inequitable conduct, and that's a high bar to meet. This could be a massive evidentiary burden, and now there is a presumption that because Mega Corp filed first, they invented first. It's your burden to rebut that, and until you can, Mega Corp goes on selling your invention to the public. This is a bit of a simplification, but you get the idea - opponents of the bill have generally been small inventors and venture capitalists, and proponents have often been major tech and engineering firms. 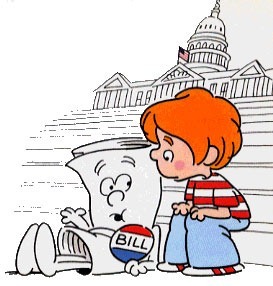 The faster you are about filing patents, the more you like this bill, basically. There's a "grace period" in the act to protect against the unfair scenario I described as a result of first-to-file, in which an inventor may publicly disclose his invention without foregoing his right to patent it, so long as he files for that patent within one year of the disclosure. But, if a third party non-inventor discloses the invention before the inventor, the inventor forfeits the right to patent because the disclosure operates as "prior art." But a semi-public disclosure of the kind I described would be very hard to prove in court, and it creates a major hurdle for the original inventor. Proponents of the bill argue that today's lengthy interference proceedings (basically, who invented it first) that are a part of major patent prosecution in our first-to-invent system pose a bureaucratic barrier to actually acquiring a patent, and that their elimination in favor of new post-grant proceedings will reduce the number of frivolous or questionable claims brought before the PTO because the incentive (stopping the patent before it's granted) has been removed. All in all, there's a lot of considerations here, and both sides are blowing smoke and making hyperbole to some extent. We won't know how first to file will affect our patent system until it comes into effect, it might not even be all that big a deal. But we've got exactly 18 months to wait on that - so try and ignore any doomsayers or hype-men until 2013. [Weekend Poll] Tablet Fight: 3G/4G Vs. Wi-Fi Only?